While living in Denver, Colorado, Mike Hallock was smitten with Oregon Pinot Noir on a steelhead salmon fishing trip. As a geologist, he spent twelve years mapping vineyard soils until he found his ideal site for Pinot Noir in 1995 at the McDonald farm on Parrett Mountain in the Chehalem Mountains AVA. 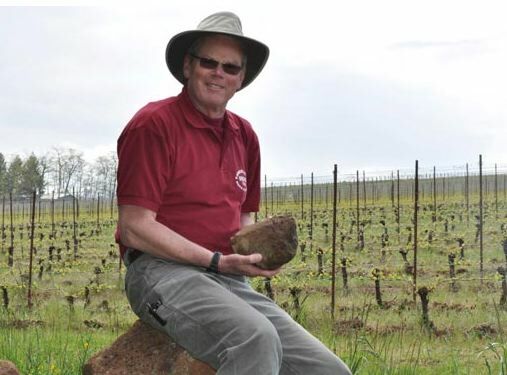 He pursued winemaking and viticulture classes at University of California at Davis, worked along side winemaker Kathy Joseph of Fiddlehead Winery who made wine in Oregon for several years, planted 49 acres in 1996 and celebrated his first harvest and wines in 1998. It was probably the largest vineyard planting at one time in the Chehalem Mountains. The first four years, he commuted from Denver to the Willamette Valley to manage the vineyard and craft the Carabella wines, finally moving out to Oregon for good in 2002. On my recent visit, I walked the entire Carabella Vineyard with Mike. The site is ideal for Pinot Noir and Chardonnay, located at an altitude of 500 to 600 feet and consisting of gravelly volcanic soils. The original 1996 planting was Pinot Noir clones 115, 114, 113 and Pommard and Wädenswil. After ten years of learning about the site, he planted 667, 777 and a little bit more of 115 in 2007. Chardonnay plantings are Dijon clone 76, and there are two different clonal blocks of Pinot Gris. Total planted acreage is now 59 acres. About half the fruit from the vineyard has been sold to premium Willamette Valley producers including Bergström (Chardonnay), Winderlea, Union Wine Co. and Beaux Freres. The vineyard is Certified Sustainable and Mike uses no herbicides or chemical pesticides. The vines are dry farmed. Along with his spouse, Cara, the couple have been gradually converting the cover crop in the vineyard to native fescue and other native flora, hoping to attract beneficial insects that live in the nearby oak Savannah. Mike’s plantings of clone 113 are unusual because this Dijon clone has been rarely established in California and Oregon in volcanic soils. ENTAV-INRA Clone 113 is from Morey St. Denis. It produces average to high sugar levels, good quality and a sufficient but sometimes irregular yield. Possibly the most elegant of the Pinot Noir clones, it is early ripening with charming aromatics and displays a classic blend of plum, cherry and raspberry fruits. This clone has prospered at Carabella Vineyard and a Dijon 113 bottling is offered, a true rarity in the Pinot Noir world. There is an interesting story behind one particular planting in the Carabella Vineyard known as the Mistake Block. In 1998, while planted Dijon 113 vines, it was discovered after the vines were planted that some vines were mislabeled. As a result, there are 13 rows of Pommard clone (3/4 acre) and these vines have turned out to produce extraordinary wine. 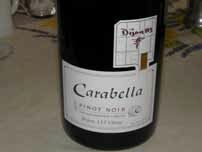 The grapes were blended into other Carabella wines until 2008 when a “Mistake Block” wine was released. Since then the wine has been produced in only select years. Carabella wines are produced exclusively from estate fruit. The wines are sold on the website at www.carabellawine.com and through a Bedrock Wine Club. There is some distribution to other states including New York, Illinois and Florida. A second, value-priced label ($20), Plowbuster, is sourced from several AVAs and has an Oregon AVA designation. It offers excellent drinking and is more widely distributed. Total production is 4,000-6,000 cases annually. The winery does not have a tasting room. 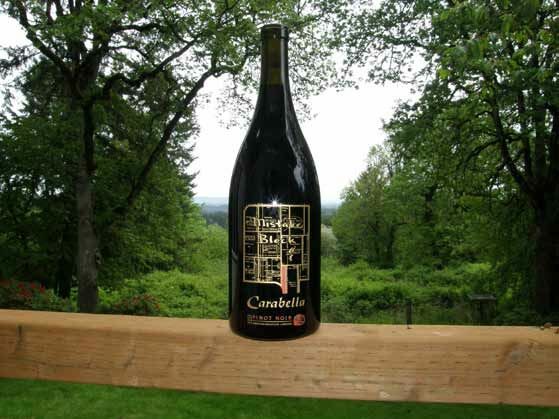 I have favorably reviewed a number of Carabella and Plowbuster wines in the past. 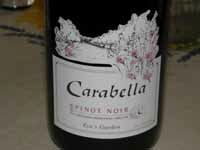 I tasted some Carabella wines in the vineyard and in the Hallock’s home. My impressions follow.